Anne Garrels takes you on a fascinating journey into the world of today's war correspondent. In the fall of '02 and spring of '03 she was documenting what the build up to war was doing to the Iraqi people. Go behind the scences to see what today's reporters go through to bring us the stories from the front line. You'll read about the bribing every reporter does simply to get in and out of the country, how every new conflict reunited old colleagues as well as rivalries, and the different tricks of the trade reporters use to get the stories in on time (like reporting naked to prevent government thugs from interrupting her broadcast. As National Public Radio's much loved and respected senior foreign correspondent Anne Garrels has covered conflicts in Chechnya, Bosnia, Kosovo, Afghanistan, and Iraq. In Naked in Baghdad she reveals how as one of only sixteen non-embedded journalists who stayed in the now legendary Palestine Hotel throughout the American invasion she managed to deliver the most immediate, insightful and independent reports with unparalleled vividness and immediacy. Her evolving relationship with her Iraqi driver/minder Amer, and the wonderful e-mail bulletins sent to friends by her husband, Vint Lawrence, counterpoint the daily events of her life in Baghdad, and result in a deeply moving, and intimate portrait by one of bravest and most enlightening news reporters. Anne Garrels has been a distinguished foreign correspondent for National Public Radio, where she is regularly heard by more than 17 million listeners weekly. When she is not covering the world's hot spots, she lives in Connecticut with her husband, three dogs, and three cats. Vint Lawrence is a former U.S. Central Intelligence Agency paramilitary officer from the elite Special Activities Division. Currently, he works as an artist, and he occasionally writes about U.S. foreign policy issues. 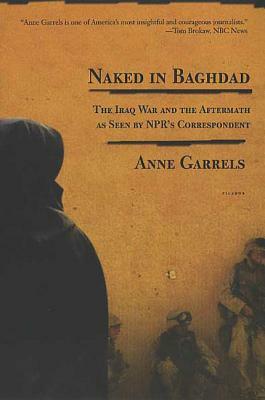 Along with his wife NPR correspondent Anne Garrels, Vint read Naked in Baghdad, published by Macmillan Audio. Vint and Anne received an AudioFile Earphones Award for their narration.